Join Us for the… 18th Annual New York State 4-H Shooting Sports Banquet & Auction! 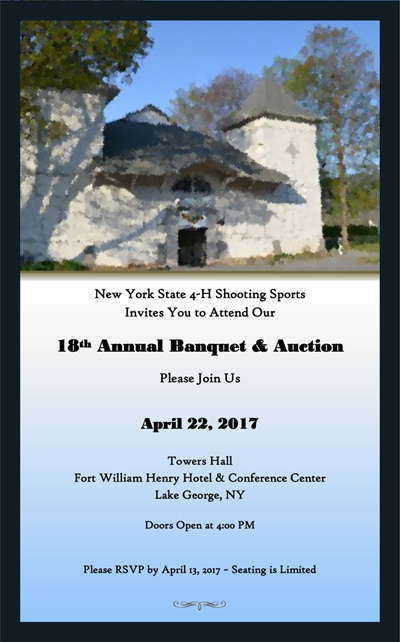 Please join us at the 18th Annual New York State 4-H Shooting Sports Banquet & Auction to be held on April 22, 2017 in historic Towers Hall overlooking beautiful Lake George, NY on the grounds of the Fort William Henry Hotel & Conference Center. Doors open at 4:00 PM for bountiful complimentary hors d’oeuvres with cash bar available. A grand buffet dinner featuring beef, chicken and pasta selections will be served at 7:00 PM prior to the Live Auction. 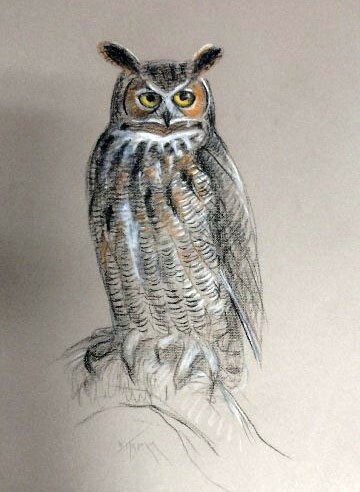 This year’s event will feature noted Wildlife Artist Wayne Trimm as our 2017 Artist of the Year with four of Wayne’s exceptional pieces of artwork up for grabs to the highest bidder including this original pastel of Bramble, the Great Horned Owl. As always, there will be hundreds of incredible items available throughout the event with something for everyone including many items from past Artists of the Year too. Auction services will once again be provided courtesy of Talk of the Town Auction Hall, John & Beverly Stanislowsky with Dusty Cleveland serving as Auctioneer. The cost of this event is $75.00 per couple or $40.00 for a single dinner ticket. Specially priced overnight packages are also still available only through NYS4-HSS. Seating for this event is limited and has sold out many times in the past – please be sure to get your reservations in as early as possible. Reservations are due by April 13, 2017. To download a copy of the Invitation/Registration please click here. Stay tuned to this blog and our website for upcoming details and more information on this year’s event!